Age discrimination may be impossible to prevent, but with some changes in our own behavior, it may be possible to reduce. 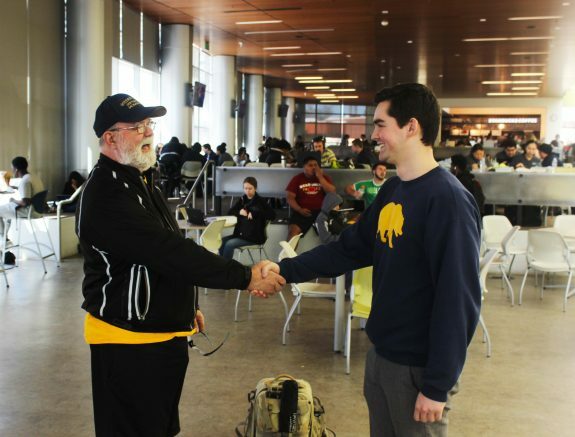 On American River College’s campus, and in general society, older generations are sometimes looked down upon. Instead, we should look up to those who are older. The older students at ARC should be more respected, because they have more life experiences compared to the younger students. ARC race and gender professor Alan Miller and baby boomer student Sarah Jane Johnson-Ford recently shared expressed their feelings on and values towards the subject. Miller, 77, has taught at ARC for over nine years and says he has no plans of retiring. Sarah Jane Johnson-Ford, who is an older student at ARC, shared her opinion on students younger than her lacking manners. Just because the younger generation can potentially outdrink the older generation throughout the college years, it doesn’t mean they need to divide themselves from one another when they could actually learn from each other. And some younger students say they respect what they can learn from older students. “Everybody has their right to go to college since we are all here for an education, but it’s up to the person themselves if they want to respect someone or not and there are people out there who need to know that,.” Nathanial Glenn, a 20-year-old computer engineering major explained. 1 Comment on "There is no age in equality"
I really like this story by Joel.